Fresh, seasonal ingredients. Beautiful presentation. 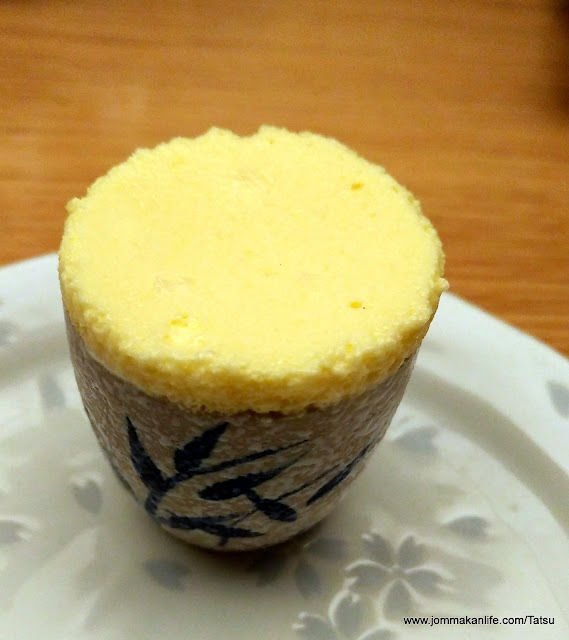 Varied cooking techniques. All these and more merge seamlessly for Tatsu’s Dine with Me promotion every Saturday and Sunday night. This special set dinner for groups of four diners sees Chef Tommy Kuan and his team focus on delivering a capsule overview of Tatsu’s best culinary repertoire. Priced at RM888 nett for 4 persons, the menu covers appetisers, main courses of seafood and meat with dessert wrapping up dinner. 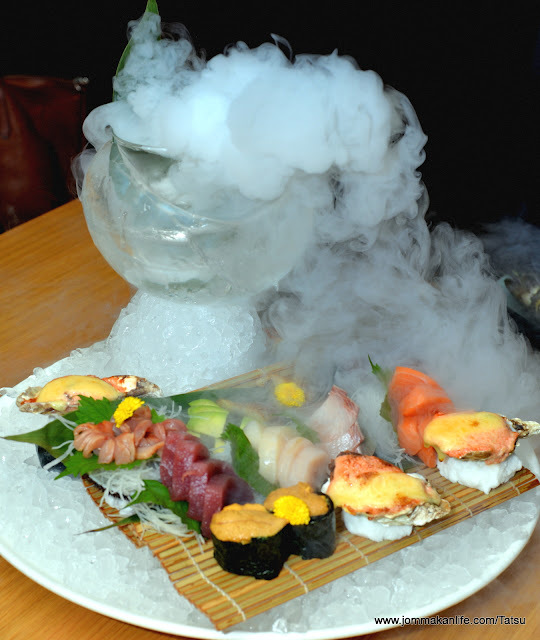 Right off the bat comes a showcase of Sashimi and Sushi, featuring Japan’s in-season catch artfully presented on ice. 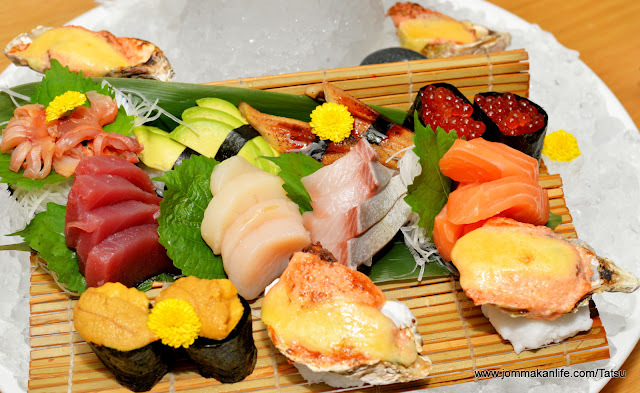 For our preview, the array included glistening, raw slices of tuna, kanpachi (yellowtail), salmon, hotate (scallop) and akagai (surf clam/ark shell) in addition to Baked Oyster Mentaiko Mayonnaise, Ikura Sushi, Avocado Sushi, Anago Sushi and Uni Sushi. 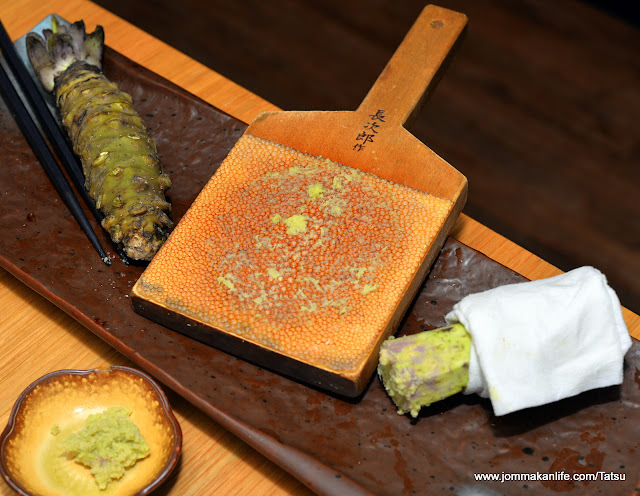 Freshness of the raw specialities should never be an issue at Tatsu – it is a five-star hotel restaurant after all – so in this aspect, we had no qualms about the quality. The only snag is having two pieces of the various sushi for a party of four so if everyone in your group loves uni (sea urchin) then tough luck, you either have to share or go without. Also we recommend eating the oysters first as the baked mollusks taste best when they are piping hot. 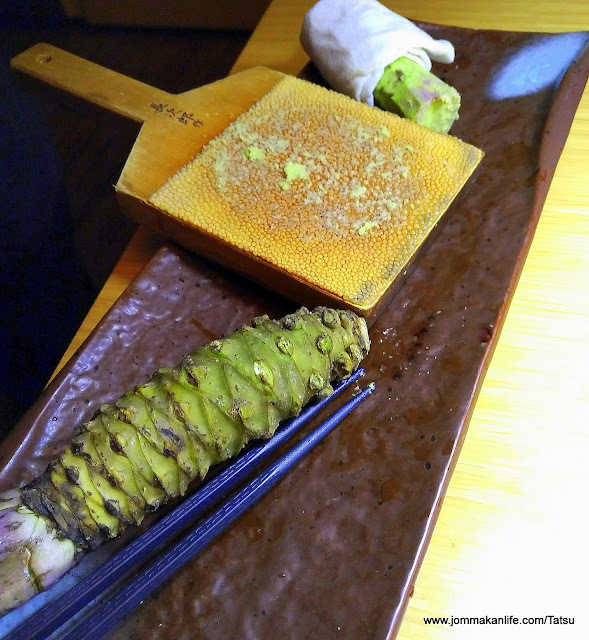 For the uninitiated, freshly grated wasabi is also served for the curtain-raiser, with the Tatsu team grating the Japanese horseradish at your tableside using a handheld wooden sharkskin-clad grater. 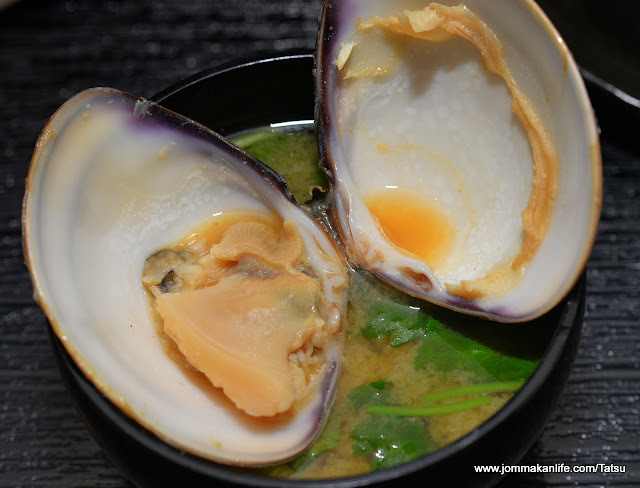 The subsequent Hamaguri Miso Soup – Japanese clam miso soup with tofu, wakame (seaweed) and spring onion warms up the dining pace, in preparation for the mains to come. 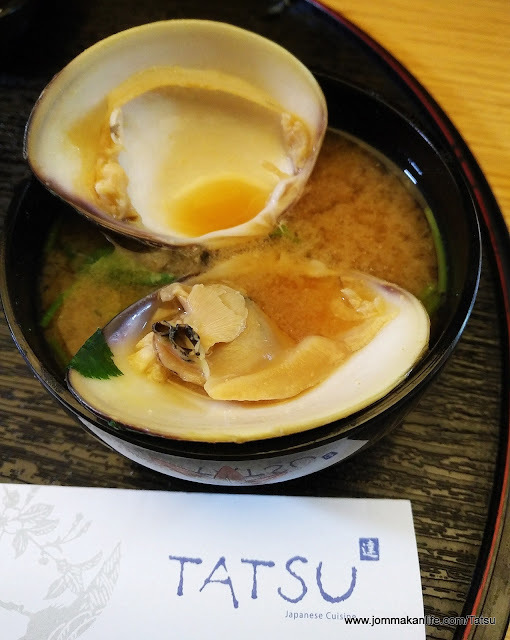 Lush savouriness of the broth mingled with the clams' inherent sea-sweetness makes this a simple but welcoming highlight of the meal. Another surfeit of seafood – total of eight items – beckons. 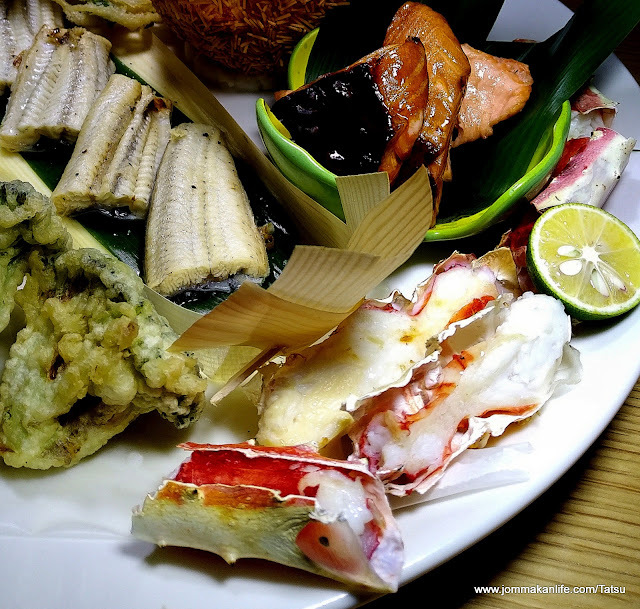 Personally, I enjoy Tarabayaki - grilled pieces of king crab the most for its delectably sweet meat. 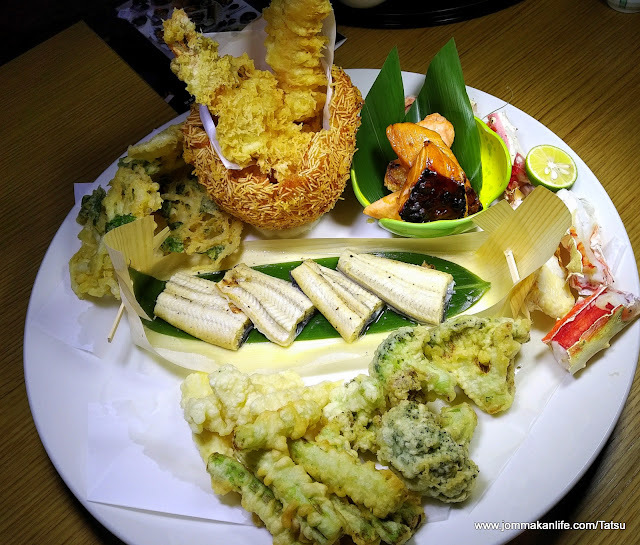 Giving more bang for your buck, the hearty platter also includes crisp, airy-light Tempura of Yamaimo (Japanese yam), Asparagus, Broccoli and Prawns. Savour the more delicately flavoured Unagi Shiro Sakamushi first before proceeding to try the offerings of Sake (salmon) Shioyaki & Teriyaki in order to better appreciate the former. Out of all these choice bites, I'd vouch for the delightful Shirao Kakiage (top pix), clumps of baby whitebait sheathed in gossamer-light tempura batter. Meaty items forming the second serving of mains are no less substantial. 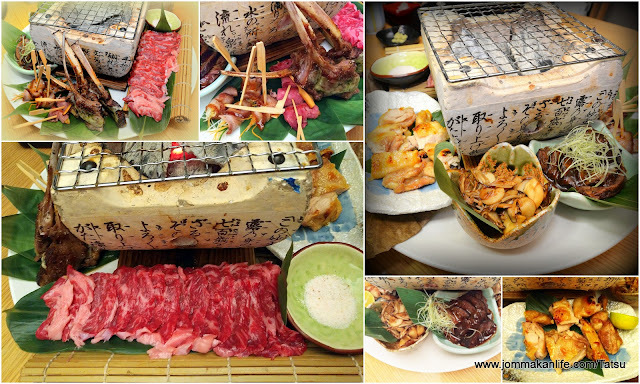 A portable charcoal-fuelled stone grill is provided for diners to grill the Wagyu Sumiyaki with Himalayan Salt. Depending on your inclination towards cooking, it is advisable to keep track of timing as it would be a shame to overcook the meltingly tender Wagyu. Should you have dining companions who are skilled at tending to the grilling process, you can then concentrate on relishing the plethora of delicious cooked options served. Crowd-pleasers include tempting Grilled Honey Chicken with Sudachi (Japanese citrus), Stewed Beef Cheek with Red Wine and Mushroom Teppanyaki. 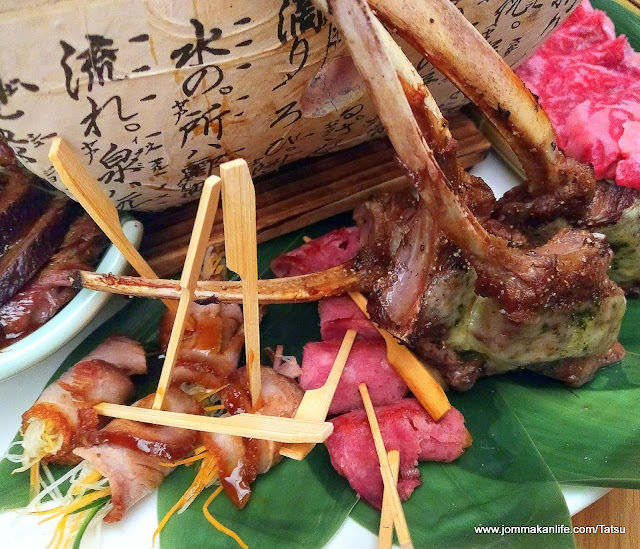 You can also warm up the Lamb Teppanyaki with Cheddar Cheese Aonori (cheese-seaweed sauce) on the mini grill for better flavour. Bacon & Fried Potato Rolls and Stewed Aigamo Rosu-ni (duck breast meat with shoyu reduction) with Julienne Carrot, Kyuri & Radish complete the entire selection to leave you replete. Ah, one is never too full to enjoy dessert and Tatsu presents not one but three sweet treats to wrap up your visit. Our top pick has to be the Grand Marnier Ice Souffle - a rare but exquisite creation that's both refreshing and irresistible on the palate. Different flavoured Mochi and Haagen-Dazs Green Tea Ice Cream will amply leave any spare tummy space filled before you pick up the tab. 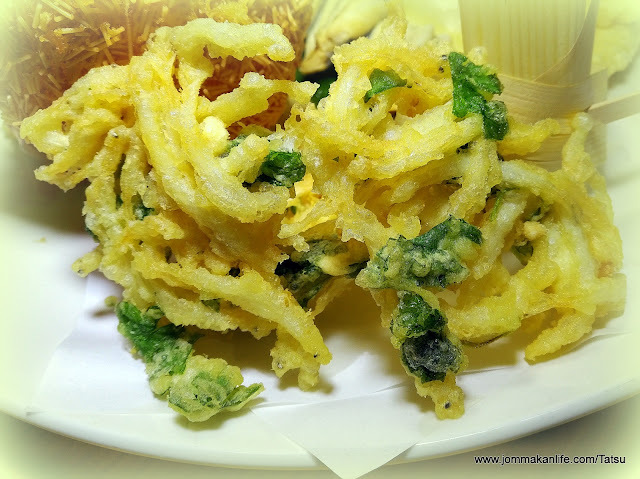 For reservations at Tatsu Japanese Cuisine, please call tel: 03-2782 6118. Address: Level 1, InterContinental Kuala Lumpur, Jalan Ampang, KL.